Previously, we posted a video about Diggy Simmons, son of hip-hop vet Rev Run. Here’s another heir to hip-hop royalty: Willow Smith. Willow inked a deal with Jay-Z’s Roc Nation label (and Rihanna collaborates with Jigga). So the song has a Rihanna-esque feel to it. Ye’s short film for “Runaway” airs tonight at 8 p.m on BET, MTV and MTV2. Vivica A. Fox stars in the 50 Cent video above. Brian McKnight will be performing in Harrisburg, but he just won’t be singing. The R&B crooner/songwriter will be acting, too, in a comedy play with actress Vivica A. Fox. 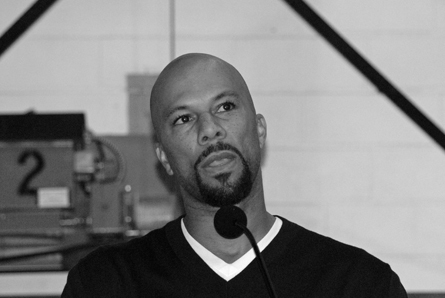 Common kicks the truth to young black youth. Photo by Leon Laing. Local rappers Mazon and Cordell kick a freestyle by borrowing Kanye’s “Lord Lord Lord” beat. Wiz Khalifa continues to rep for his hometown with this Pittsburgh anthem. The video game hits stores Oct. 5.